The fluid sensors market is feeding off the prosperity of various end-use industries and is poised for a lucrative future. And, since the technology is not exclusive, an increasing number of players are connecting to the value chain to make the competitive landscape fragmented, according to a recent business and commerce study by Transparency Market Research. The analysts of the report have projected the demand in the global fluid sensors market to multiply at a notable CAGR of 5.6% during the forecast period of 2017 to 2025. In terms of revenue, the market for fluid sensors, collectively across the world, is estimated to be worth US$18,026.8 mn by 2025. For a foreseeable future, the competition in the global fluid sensors market is anticipated to remain intense, with the players focusing on pricing their products aggressively in order to lure a greater chunk of customers. In addition to that, while strategic partnerships and acquisition activities will help the major players to further strengthen their position across regions, research and development of new products is also expected to carve a niche for the players. For instance, NXP Semiconductor offers highly sensitive and long-term repeatable products such as barometric pressure sensors of 15 to 115 kPa, which are used for industrial controls and engine control, and vacuum sensors of -50 to -115kPa, which are ideal for pressure switching and medical ventilator. Gems Sensors and Controls is another prominent company in the global fluid sensors market, holding a position of strength via its impressive product portfolio that meets the needs of diverse companies functioning in the fields of agriculture, alternative energy, food and beverages, marine, printing, semiconductor manufacturing, and process tank gauging. The report also identifies Schneider Electric AG, SICK AG, Honeywell Corporation, BOSCH, Yokogawa Electric Corporation, Infineon Technology, LORD Corporation., Futek Advance Sensor Technologies, General Electric Company, and Sensirion AG as some of the other key players currently ahead of the curve in the global fluid sensors market. Based on product type, the report segments the fluid sensors market into pressure sensor, flow sensor, temperature sensor, and level sensors, whereas on the basis of detection medium, the market has been bifurcated into gas, liquid, and plasma. Measurement categorization of the market has been done into non-contact and contact. The report also gauges the potential of demand that can be expected from the end use industries of power generation, oil and gas, chemical, water and waste water treatment, food and beverages, and others. 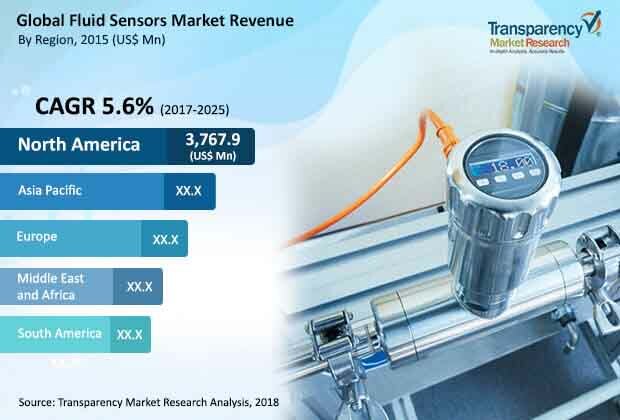 Geographically, North America has been highlighted as the most profitable region in the global fluid sensors market, although the demand from the region of Asia Pacific is primed to expand at an above-average growth rate. Growing demand for accurate detection of fluid level monitoring, temperature sensing, and pressure sensing in the oil & gas and chemical industry is the primary driver of the global fluid sensors market. The adoption of fluid sensors is also expanding as the advanced products offer extended durability, flexibility, and reliability, regardless of the environment. In addition to that, the fluid sensors market is also expected to gain traction from the water & waste water industry, which can be attributed to its non-invasive sensing methodology features. Moreover, strict government regulations and acts is also expected to reflect positively on the market for fluid sensors in the near future. Shares in the global fluid sensors market are distributed among a large pool of players. Waste water treatment segment emerging as a tremendous opportunity. Asia Pacific turning into a region with vast potential, promising to match North America’s demand for fluid sensors, both in terms of value and volume.